Oh man, we’ve got yuuuuuge breaking news on the Android distribution front. You ready for it? Seriously, are you ready for this? Well, if you read the title, you know it, but yes, Froyo is finally dead! Google updated the Android distribution numbers for January 2017 and Froyo has finally been retired from the list, having dropped below the 0.1% threshold needed to stick around. Man, Android 2.2 is gone for good. Struggling to deal with this…reflecting back. What times those were, overclocking single-core processors to melt our hands while blacking out everything via cheesy embossed themed ROM for an extra 3 minutes of battery. Good stuff. In terms of new numbers, we’re looking at Nougat jumping from 0.4% of the pie to 0.7% and Marshmallow shooting from 26.3% to 29.6%. After that, everyone else is in decline. 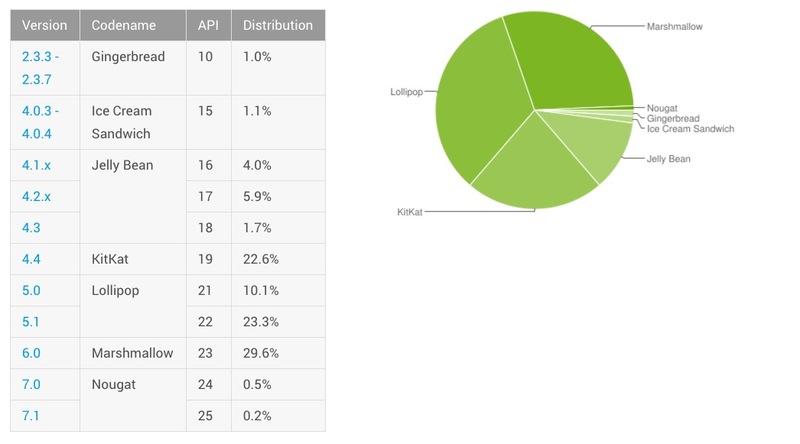 Lollipop now sits at 33.4% (34%), Kit Kat at 22.6% (24%), Jelly Bean at 11.6% (12.8%), Ice Cream Sandwich at 1.1% (1.2%), and Gingerbread at 1.0% (1.2%). December’s numbers can be seen right here.